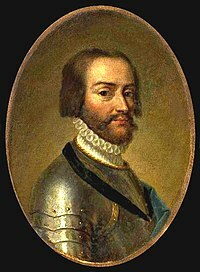 Charles de Bourbon (2 Juin 1489 – 25 Mairch 1537) wis a prince du sang an military commander at the coort o Francis I of Fraunce. He is notable as the paternal grandfather o Keeng Henry IV o Fraunce who wis the first Bourbon Keeng o Fraunce an thus ancestor o Louis XIII, Louis XIV, an Louis XVI. Louis de Bourbon (1514–1516), died in infancy. Marguerite de Bourbon (1516–1589), mairit François, Duke o Nevers (1516–1561). Antoine de Bourbon, Duke o Vendôme 22 Aprile 1518 – 17 November 1562) mairit Jeanne d'Albret an haed childer. François de Bourbon, Coont o Enghien (23 September 1519 – 23 Februar 1546) unmairit an nae childer. Madeleine de Bourbon (1521–1561), Abbess o Sainte Croix de Poitiers. Louis de Bourbon (1522–1525), died in infancy. Charles de Bourbon (22 September 1523 – 9 Mey 1590), Archbishop o Rouen. Catherine de Bourbon (1525–1594), Abbess o Soissons. Renée de Bourbon (1527–1583), Abbess o Chelles. Jean de Bourbon, Coont o Soissons (1528–1557), mairit Marie, Duchess o Estouteville. Louis de Bourbon, Prince o Condé (1530–1569) mairit Éléonore de Roucy an haed childer. Remairit Françoise d'Orléans an haed childer. Léonore de Bourbon (1532–1611), Abbess of Fontevraud. This page wis last eeditit on 10 Februar 2019, at 14:23.